Ah, Mount Sylvan. Such a magnificent sight. 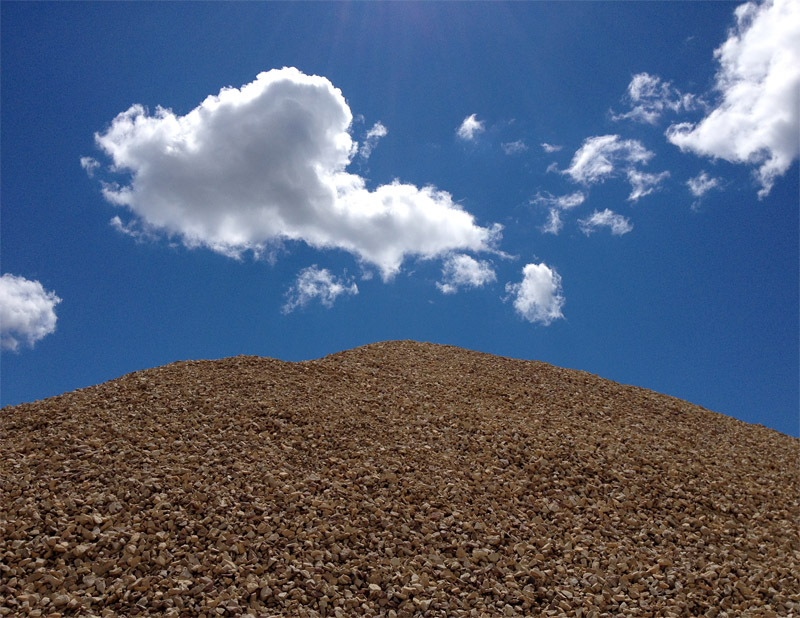 And nearby, those huge rocky cliffs reach up to the sky! I admit this is not really such a grand landscape as it might first appear. 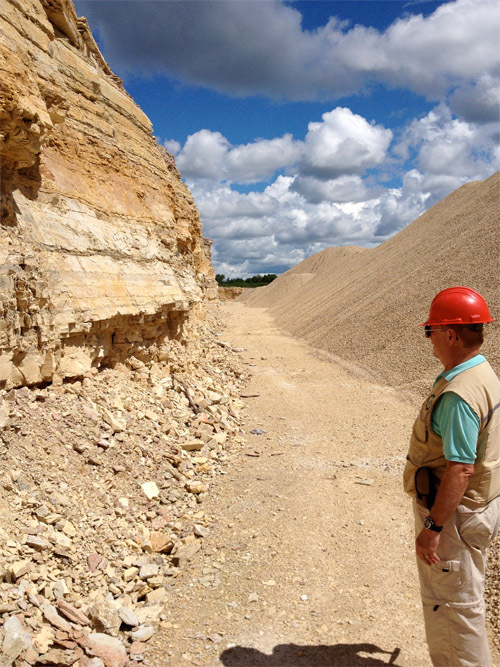 In Manitoba’s Interlake you have to take your topography where you can find it, and heaps of quarried limestone may well be the tallest features from one horizon to the other. 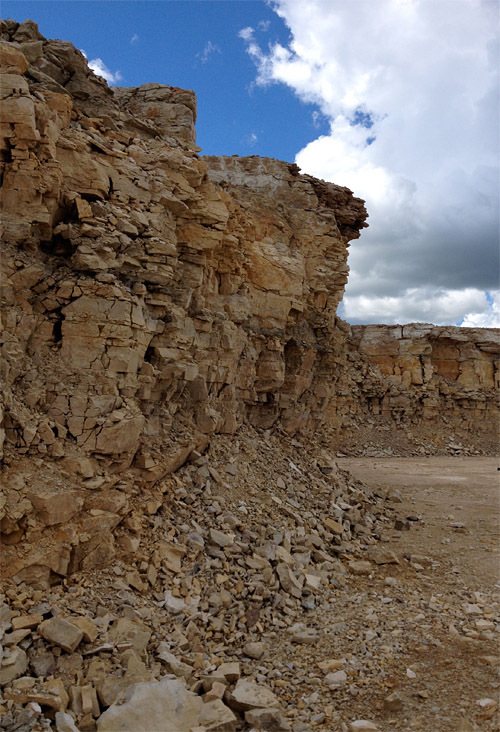 The quarry at Sylvan is not a particularly good fossil locality, but in contains a fascinating succession of shallow-water carbonates that represent deposition under fluctuating environmental conditions. 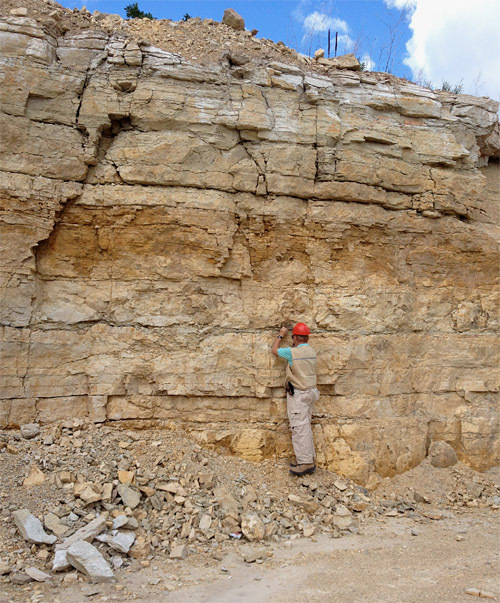 Jim Bamburak of the Manitoba Geological Survey examines a dolostone face at Sylvan Quarry. Bryozoan-containing cherts at the base of the quarry are succeeded by a variety of other units including thin-bedded dolostones, microbialites, beds showing internal brecciation, and some intriguing clay-like horizons. One stromatolitic interval has yielded odd phosphatic bits, and we periodically revisit the site with the hope that more diagnostic phosphate components will show up (ideally parts of early fishes, but other things would be fine too). So much depends on how active the quarrying has been in the intervening months, and how much of the faces we can see. Last Monday, when I took these photos, the faces were muddy and we could not get to them very easily, but we will be back. We just have to be patient . . . The thin grey horizon is in the Ordovician Fort Garry Member of the Red River Formation; the transition to the Stony Mountain Formation is located near the top of the quarry. Please excuse the relatively poor image quality in these photos. It was my first day in the field this summer and I had somehow managed to forget to pack a camera, so the iPhone had to suffice! ← Save the Polar Bear! Graham: These scenes remind me so much of the hours spent roaming the aggregate quarries here in the days when they were more easily accessible (liability rears its ugly head). Not exactly sylvan landscapes, they really were treasure troves of fossils and earth history. My friend Wolfgang V usually got us in and he would proceed to find a huge Isotelus!